I went into the office on Wednesday an hour early to do some software updates. I overslept, so I didn’t make coffee. S’okay, I thought as I opened the front door. I can get breakfast across the street. Across the street is Frommage du Monde, home of the German Farmer Breakfast Taco. Made with Opa’s sausage, eggs, cheese, and a choice of mango chutney or hot salsa, it is, in the words of my cousin, the best reason you take cholesterol medicine. After a successful-ish update (There was no swearing, at least) I ventured out for breakfast. 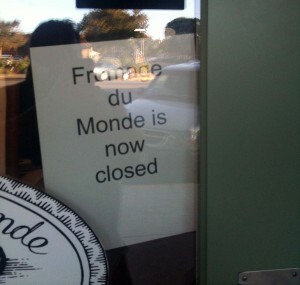 Frommage du Monde was closed! Forever! If you were waiting to sample the Frommage du Monde paninis, or, like me, waiting for the perfect time to get some of that awesome looking cheese, it’s too late. We should have done it sooner. /wp-content/uploads/logo-new4.png 0 0 Jeff /wp-content/uploads/logo-new4.png Jeff2010-10-28 07:42:152010-10-28 08:49:12The Horror! The Horror!